In Costa Rica, we have two coasts, a pair of shorelines that touch two oceans. To the west and south, we have the Pacific, go east and north and a birder scans the Atlantic. However, in Costa Rica, we don’t usually refer to that body of water as the Atlantic, nor even as an ocean. 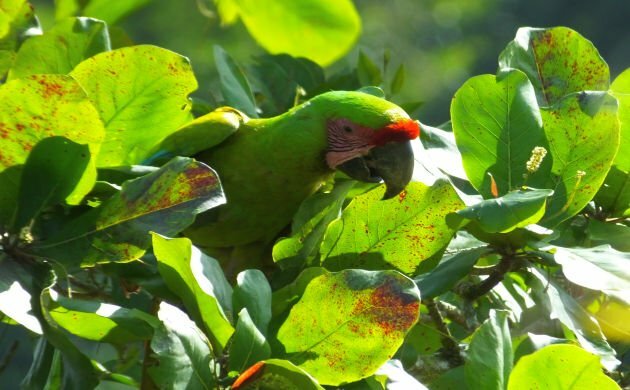 Around here, it’s the Caribbean Sea and that’s also why we bird the Caribbean slope, we look for macaws, toucans, and Great Potoos in the Caribbean lowlands. 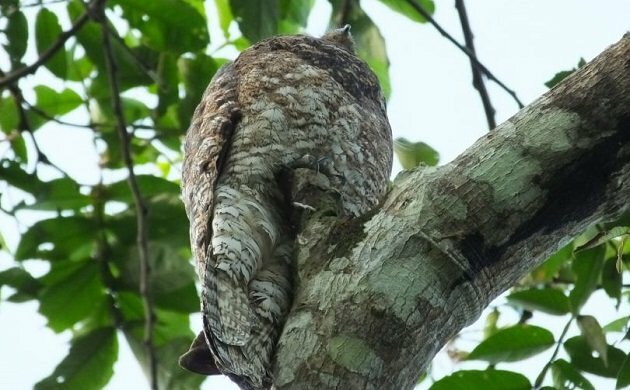 The Great Potoo is a big, blocky-headed bunch of feathers. 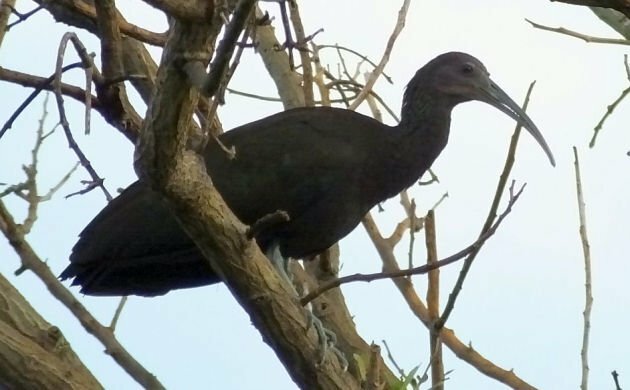 Although sightings of this vulterine waterbird have increased on the Pacific slope, for the most part, in Costa Rica, the Green Ibis is still a bird of the Caribbean lowlands. Watch for birds masquerading as Black Vultures along rivers, in swampy rainforest, and wetlands near forest. They also get points for making raucous, rollicking calls at dusk and dawn. 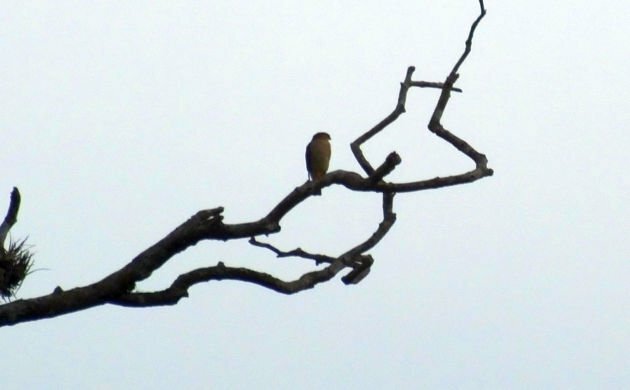 A hawk that’s too small? Ha, what could it prey on, bugs? If only. This robin sized raptor is lethal, especially for hummingbirds and even tanagers. I saw one clutching a Scarlet-rumped Tanager, a bird of nearly the same size, I don’t know how it carried it away. What makes the Tiny Hawk even more dangerous is its penchant to ambush small birds in clearings. Just when a manakin feels safe it has to deal with the possibility of being killed by a pint-sized, voracious thing with needle-sharp talons. This one is a real prize to see, look for it perched high in a tree in the early morning, or zipping through a forest gap in search of unwary birds. Huge. Spectacular. Endangered. Often seen at the right sites. How could this amazing bird not be cool! Even better, many now feed on Beach Almonds, a tree planted in many areas for shade. This makes it easy to see this mega at Tortuguero and various other sites in the Caribbean lowlands. Since all owls are automatically cool, I wouldn’t say that this is the coolest. No, I won’t go that far but I will say that it’s an excellent rep. for its kind. This species is actually fairly common in areas with rainforest. Listen for its gruff call at night, keep an eye out for it during the day. 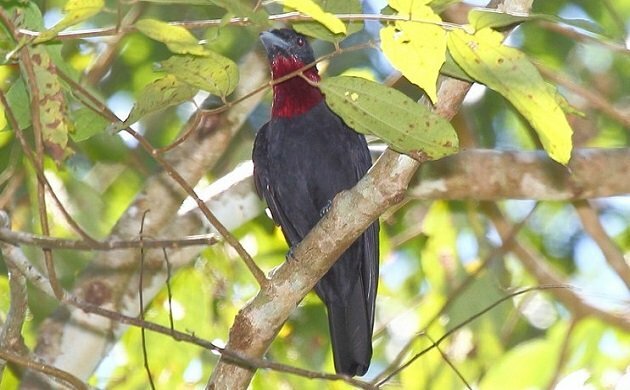 It likes to roost in lower parts of the forest where there are large, hanging dead leaves. Immortalized by a cereal box, these birds are real and larger than life. 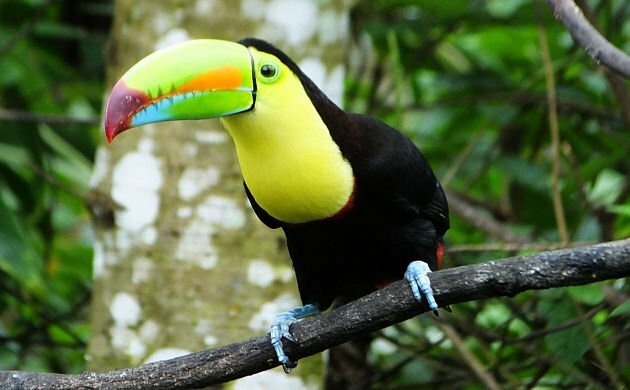 Big, colorful, smart, and vocal, seeing toucans is wonderful. In some places, they even come to fruit feeders and are fairly common in the Caribbean lowlands. Several species of woodpeckers occur in this birdy part of Costa Rica. Most are handsome beasts, a few will knock your birding socks off. One of those few is the Chestnut-colored Woodpecker. As with other Celeus genus woodpeckers, this one has beautiful rufous plumage. Much to our delight, it also has a bronze-copper, crested head and can forage quite low! 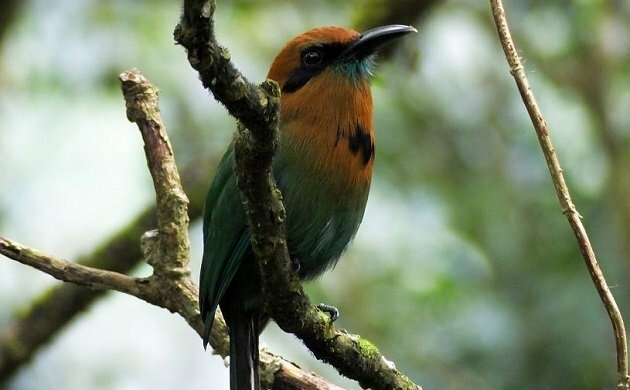 If you are birding in the Caribbean lowlands and hear something that sounds kind of like an old train whistle (sort of), it’s probably a Broad-billed Motmot. This most common motmot of the Caribbean lowlands is one of those exotic avian beauties a birder just has to see. Luckily, it’s pretty common and even occurs in old second growth! Yet another exotic, cool species, this one is much less common. 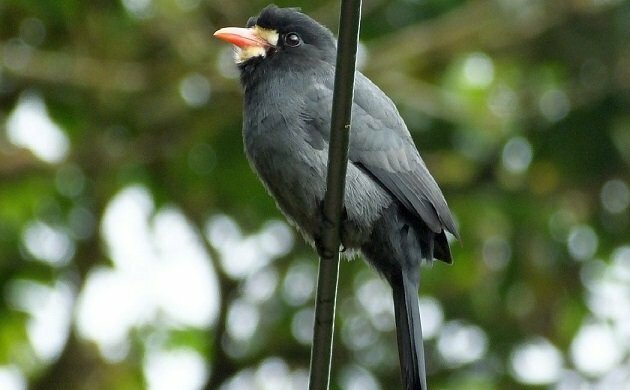 A true denizen of mature rainforest, the White-fronted Nunbird is large and in charge. 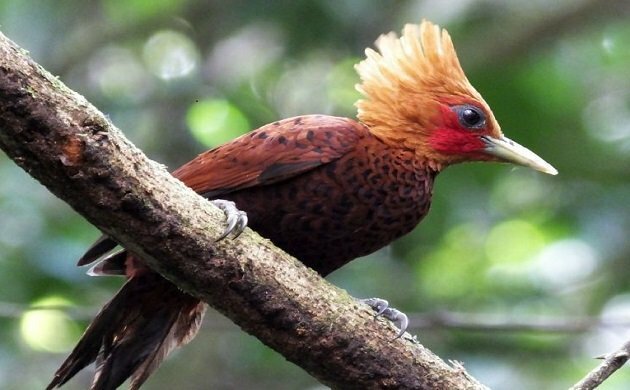 Small groups of this eye-catching bird range through the canopy of high quality forest, sometimes in accompaniment of other species. 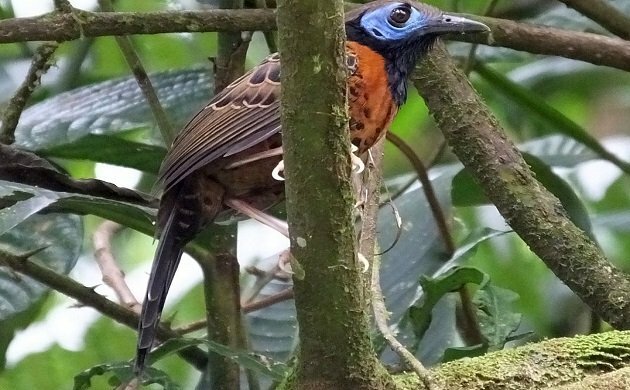 This most fancy of Central American antbirds is quite the cool catch. Although it can be hard to find, when an antswarm is encountered in rainforest, this species is usually present. The tenth cool bird on this list is this wild cotinga. Around the same size as a small crow, this species moves through the canopy with quick, swooping flight, and shivers its tail upon landing. It also gives, frequent, distinctive calls. 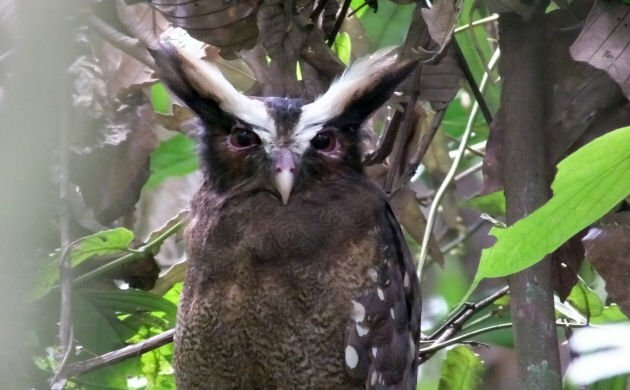 This list of cool birds is of course far from complete. 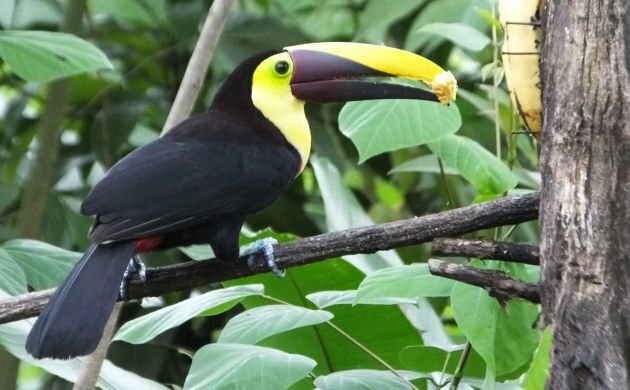 When it comes down to it, with 400 something species to choose from, there’s just never enough time nor room to list all of the cool birds from this part of Costa Rica. What about the subtle yet cool Plain-colored Tanager? The persnickety Yellow Tyrannulet? Those tinamous that haunt the humid understory with their minor key whistled songs. Of course, the best way to decide which bird might be cooler than another is by seeing them with your own binos. Come on down, the Caribbean lowlands of Costa Rica are closer than you think. They seemed to be much scarcer that Scarlets? WP-Cache and Feedburner Not Friendly?